The term "call" (from kahal (קהל) community in Hebrew) designated in the Middle Ages, a Jewry (Jewish Quarter) in Palma. It is from 1300 that the Jewish community settled in the Call Major, the Great Jewry, having lived in two other areas: the old Roman city, the Call of Almudaina, the Jewry of Almudaina, and Callet, or Small Jewry. To 1290, Jaume II assigned to a Jewish ghetto surrounded by walls, closed by doors for their own protection. The ghetto was located in the district of Calatrava in the parish of St. Eulalia, he understood the Carrer de Monti-Sion Street and the Jews. Call the Major occupied the northeast quarter of the medieval city where the Jews were obliged to spend the night and live, but not work. In fact, many Jews had their stores or their businesses outside the Jewish Quarter. The early fourteenth century, the Call was surrounded by a wall, it was reached by four gates spread along the perimeter. 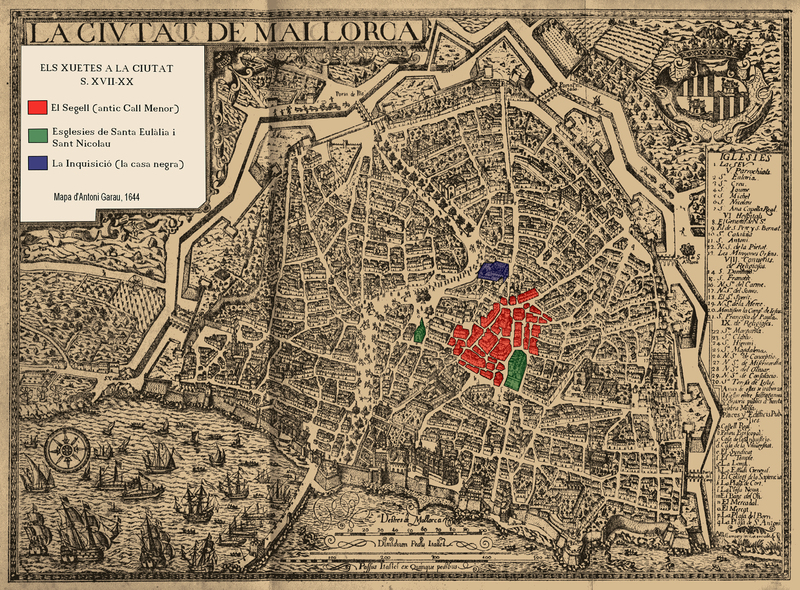 The area consisted of six major blocks that connected together by two main routes: Carrer del Sol and the current streets of Monti-Sion and Seminari Vell. In these blocks, the houses were often organized around a garden or patio, providing added protection and privacy for its residents. In the urban fabric, add a series of dead ends that allowed a more intimate link between patios or gardens that opened onto the back of the house. Na Dragona and Can Conrado are two examples of these streets that have survived to this day. In the second half of the fourteenth century, the growth of the Jewish population necessitated the acquisition of houses beyond the walls of the Call. Thus were occupied peripheral streets (el Temple, Salom, Torre de l’Amor…). Does living outside the walls that protected the Call, weakening the Jewish community, and to a certain extent, facilitated the attack by the mob in 1391. In the Jewish Quarter (Barri Jueu) lived some famous characters: Rabbi Shimon ben Tzemach Duran (1361-1444) who emigrated to Algiers, where he became one of the most important rabbis, the doctor Judah Mosconi (mid-fourteenth century) the Talmudic Jonah Desmaestre (late fourteenth century), Isaac Nifoci astronomer, cartographer Abraham Cresces (- about 1381). After the plagues of 1370 and 1380, the rioters demanded the expulsion of the Jews from the island in 1391, and from 1413, sermons were conducted - including the future St. Vincent Ferrer - for the conversion of Jews. Although the Jewish community has - officially - disappeared in 1434, when it was finally forced to convert to Christianity, Judaism did not disappear Mallorca, thanks to those who persisted. These descendants were known as the "Xuetes / Chuetas" and suspected of secretly practicing their old religion were often persecuted (and sometimes sentenced to death) by the Inquisition, and suffered from social exclusion until well in the twentieth century. The Great Gate of Jewry (Porta del Call Major) was the main gate of the Jewish Quarter, located at the junction of Street of Monti-Sion and street del Sol. This has enabled communication between Jewry and the city center. Just behind the door on the right side of the street Monti-Sion, was the butcher’s Call. In 1304, it was the butcher Isaac Nafussí was approved by the Aljama for slaughter cattle according to the Jewish ritual (shechita), so that the meat was able (kosher) for consumption by the Jewish community. Sun Street (Carrer del Sol) was also known as the Jews Street (Carrer dels Jueus). In this street are kept remarkable medieval houses that belonged to Jews. The current school of tourism, with its artistic woodwork, is one of the best examples. The number and size of these old medieval houses that had to teach us to live in this street the richest families. The Street Children (Carrer de la Criança) could be the oldest street in the Taverns (Carrer de les Taverns), which appears in old documents. It is mentioned from 1339 to 1350, the name of the Jewish innkeeper Atlel who sold the Jewish wine (vin juevesch), that is to say kosher wine. This narrow street connects the two most important streets of Call: Carrer del Sol and Carrer de Monti-Sion. This street also keeps medieval houses, in one of which were discovered wall paintings with inscriptions in Hebrew. The Gate of the Temple Trough (Porta de l’Abeurador del Temple) is located at the confluence of streets del Sol, and the Pelleteria dels Botons, it was the eastern gate of the Call, which opens next to the trough located in front of the fortress of the Knights Templar. 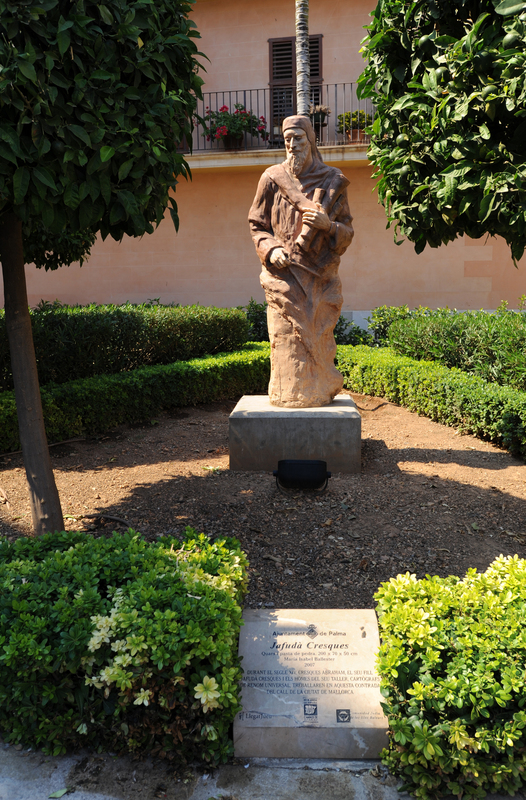 Now stands here a statue of the Jewish and illustrious son of Majorca, Jafudà Cresques (1350-to 1427), renowned naval cartographer who lived close by. The Street of the Buttons (Carrer dels Botons) defines the eastern part of the Call of origin before its extension beyond its walls. It retains a medieval house at the time. This street ends at the intersection of the street from the Old Seminary (Seminari Vell), from St. Jerome Square and Street Can Calders. The latter has probably taken the name of a Majorcan Jewish family, that of Isaac and Abraham de Caldes, mentioned in the Jewry in the second half of the fourteenth century. Street of the Peltry (Carrer de la Pelleteria) was known as the street of the New Synagogue, because if it was the last synagogue Call. It was built thanks to the legacy of Aaron Mani in 1370. It was severely damaged during the attack in 1391 and was rebuilt soon after by Jews from Portugal. Its location can be located where there was the oven Can Miquel. The synagogue was also accessible through the impasse Can Conrado, which communicates with the Carrer del Sol. Today Carrer de la Pelleteria is amputated, but in medieval times this street was to the present Street of the Posada de Montserrat. At the end of the sixteenth century it was occupied by the School of Monti-Sion, and in its place, was opened in parallel, a new street, the Street of the Schools (Carrer de les Escoles). In the Street of Mount-Sion (Carrer de Monti-Sion), also known as the street of the Call Major, was the first synagogue at the site of the present church of Monti-Sion. It was the largest and most magnificent synagogue of Jewry. Jaume III, designated as the "curiosam et valde formosam". The synagogue just completed, the king confiscated the Sanç I, as a punishment, and converts it into a church, the church of Mount Sion. The street of Mount-Sion crossed the area from east to west with at both ends of Porta de les Torres Llevaneres and Porta Major. 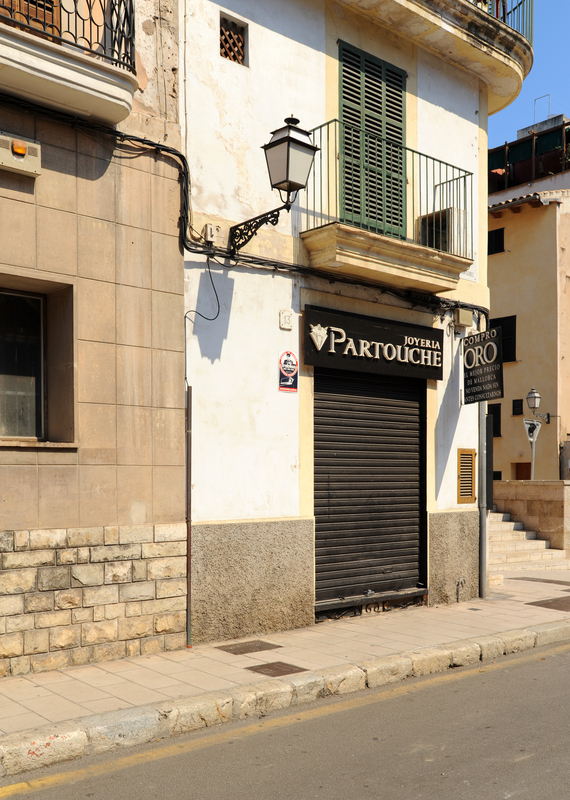 The first door should be located at the intersection of streets dels Botons, Can Calders and Seminari Vell. At first, the Street of the Inn of Montserrat (Carrer de la Posada de Montserrat) was outside of the Call. It was the door of Calatrava, which was reached by the Jewry. After the extension of the Jewish neighborhood outside the walls, in the second half of the fourteenth century, this street was built to Call. In fact, this is where the Great Synagogue was built after the close of the first, that of Monti-Sion, 1313. This synagogue was at the height of the former seminary. Over time this street became known as the street of the Old Synagogue (Carrer de la Sinagoga Vella), as opposed to the new synagogue was built in the Street of the Pelleteria. The Street of the Wind (Carrer del Vent) flanks one side of the church of Monti-Sion, on the site of the first synagogue, and was known for this reason, as the street from the synagogue. Among the oldest paved street, there are identifiable remains of the ancient synagogue. Can Dusai Street was laid in the second half of the fourteenth century, in order to connect two important Jewish neighborhoods: the Monti-Sion and the Sant Alonso (formerly Born de Santa Clara). The street is named after the Dusai family, some of whom are mentioned in the Call in 1350. In this street lived in the late fourteenth century, the Jewish Meir Duzay, whose descendants preserved converted the house until the seventeenth century. Little of the life of the Jewish community are known in the Madina Mayurqa during the Muslim occupation, the Jews lived in Almudaina, which was surrounded by walls and contained the "Castell dels Jueus" (the castle of the Jews). The old Jewish quarter of Portella was located near the walls. It seems that in 1229 the Jewish community supported James I at the time of the conquest of the island of Muslims. The king gave them various privileges and properties. The community was established in two districts close to each other. The first was the Call of Almudaina, the ancient Roman Palma, where they resided during the Muslim occupation. In 1231, Jaume I allowed them to build a synagogue that was in the current street from the Royal Palace (Carrer del Palau Reial), on the site now occupied by the Parliament of the Balearic Islands. It seems that the Jewish community lived in different streets of this neighborhood. 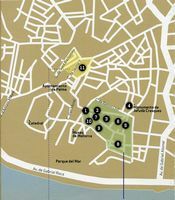 The second area was known as Callet or Little Jewry (Call Menor), this area was located on the land of the Lord Nuno Sanç. This small Jewry included St. Bartholomew (Carrer de Sant Bartomeu), also known as the Street of the Jews (Carrer dels Jueus), Street Jaume II (formerly known as the Segell) and Bosseria street. The Callet also had a synagogue, mentioned in 1232, located in the current dead-end Reixa but had another entrance on Santa Bárbara Street. Although the Jewish community moved at the beginning of the fourteenth century to the Call Major, Jews continued to have local shops and in the Callet. This is the reason that after the final forced conversion in 1435, the Chuetas settled again in the Callet.